An unplanned reformation of Yes in 1983 led to 90125, their most successful album commercially. What became their the eleventh studio album overall, was initially intended to be the debut album for a new rock trio called Cinema, featuring (then) former Yes members bassist Chris Squire and drummer Alan White, along with South African guitarist and songwriter Trevor Rabin. The album ultimately introduced Yes, which had originally disbanded in 1981, to a new crop of music fans during the MTV generation. 90125 also spawned several hit songs, including the band’s first and only #1 hit along with their only Grammy winning track. Yes officially disbanded in 1981 at which time Squire and White attempted to start a supergroup called XYZ (ex-Yes and Zeppelin) with former Led Zeppelin members Robert plant and Jimmy Page. XYZ did compose several tracks but only really had one rehearsal, after which Plant decided not to continue. With that project’s future in limbo, Squire and White recorded a Christmas 1981 single called “Run With the Fox” before forming Cinema with Rabin in early 1982. Producer Trevor Horn was also a brief member of Yes, as their lead singer on the 1980 album Cinema. Along with the trio, Horn decided the group needed a keyboard player and Squire invited original Yes keyboardist Tony Kaye who had been fired from the group in 1971 during the recording of The Yes Album. Recording of the Cinema “debut” began in November 1982. In April 1983, former Yes front man Jon Anderson heard some of the “Cinema” recordings and was very much impressed. He suggested joining the project as a reformation of Yes. Rabin, the only member of the group without a history in Yes, wrote the bulk of the material for 90125 and was at first dubious about the Yes reunion idea. He also didn’t want to be considered as simply the replacement of former guitarist Steve Howe, who was now in the group Asia. However, he did compromise and let Anderson and Horn re-write much of the material to suit the full lineup and Yes style. The album’s original first side was filled with charting singles. “Hold On” reached #27 On the Mainstream Rock chart and starts as kind of an upbeat bluesy ballad with later added sonic textures including a choppy organ, a heavy guitar and plenty of vocal motifs. The tune was actually a combination of two songs by Rabin and the two distinct parts of the song are held together nicely by the simple but effective drumming by Alan White. “It Can Happen” may be a song either of hope or foreboding and uses a synthesized sitar sound for the main riff. The song, which gets a bit more intense towards the end, reached the Billboard Top Forty in 1984. “Changes” has a long xylophone-like intro playing a very syncopated riff, similar to Yes of yesterdays, until it breaks into a standard rock beat with bluesy overtones. The lead single from 90125 and the band’s first and only #1 hit was “Owner of a Lonely Heart”. The song originated from a solo demo by Rabin in 1980 and was originally written as a ballad. Trevor Horn later developed this album version as a final addition for commercial purposes. The song contains excellent production which includes plenty of orchestral and odd instrumental samples above the crisp guitar riff, strong rhythm, and soaring vocals. The second side begins with a track named after the original group name for this project. “Cinema” developed from a twenty minute-long track with the working title “Time”, but was paired back to a barely two minute final product. The song is driven by White’s intensive drumming and Squire’s fretless bass, which topical instrumentation that gives it a sound more like old Genesis than old Yes. In 1985 it won the Grammy Award for Best Rock Instrumental, the Yes’s only Grammy. A half decade before Bobby McFerrin made it popular, the a cappella vocals of “Leave It” drove the early choruses of this fine pop song with precision polyphonic vocal effects. Above this orchestra of vocals, Squire and Anderson alternate lead vocal duties on this popular radio hit which peaked at number 24 on the American pop chart. The fun continues with the exciting intro of “Our Song”, which sounds like a cross between Rush and Dire Straits stylistically. It is the hardest rocking track on the album, led by Kaye’s intense organ riff. The song references a 1977 Yes concert in Toledo, Ohio, where the temperature inside the arena reportedly reached over 120 °F, resulting in the song being a big hit in that area (while a moderate hit everywhere else). “City of Love” starts with doomy bass and synth orchestral effects and is decorated by 1980s sounds while maintaining an entertaining rock core. The album’s closer “Hearts” works off a simple Eastern-sounding verse with vocal duet sections and a couple of inspired guitar leads by Rabin. After abandoning this initial riff, the seven-minute track morphs into many interesting sections, with Anderson firmly taking over vocally while building on the general feel of the song. 90125 reached #5 on the album charts and has sold over three million copies, by far the band’s most successful album commercially. 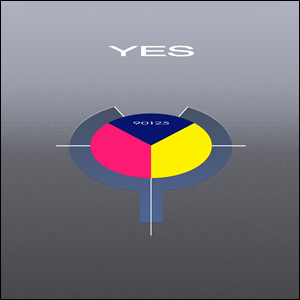 This same incarnation of the band and production team returned with Big Generator in 1987, another successful album of contemporary and catchy with the edge that only Yes provides. Several corrections to be made. Cinema was never going to be a new rock trio. It was always going to include keyboards, hence Tony Kaye. Yes’ 1980 album was ‘Drama,’ not ‘Cinema.’ Kaye was not fired during the recording of ‘The Yes Album,’ but after their UK tour supporting that album in ’71, which followed their US tour. Lastly, the 90125 album has now sold over 5 million copies worldwide.